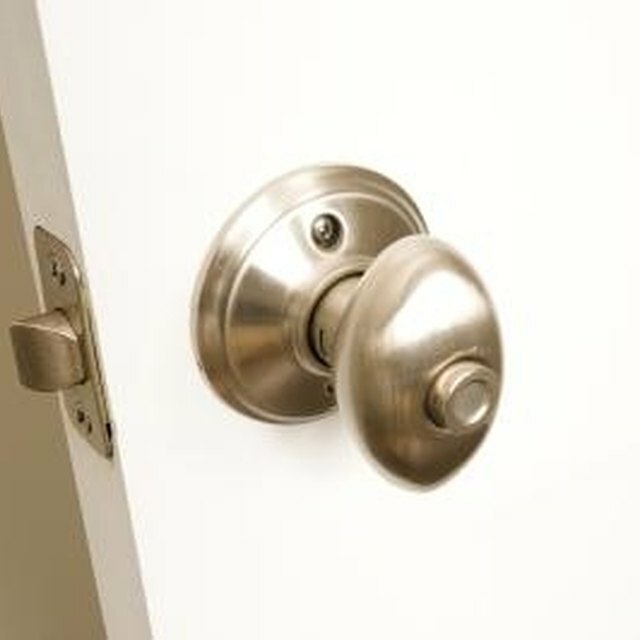 The two hinges that connect a door to a door frame are in plain sight. You can replace the conventional hinges with hidden hinges--or piano hinges--that will not be seen. The hidden hinges will not damage the door in any way and won't affect how you use the door. Insert the tip of the flat-edged screwdriver into the hinge at the top of the door. Lift up on the tip of the flat-edged screwdriver to loosen the hinge pin. Use a ladder if you can't easily reach the top of the door. Clamp the jaws of the pliers around the top of the hinge pin. Pull the hinge pin out of the hinge frame in the doorway. Repeat this procedure to remove the hinge pin from the hinge frame at the bottom of the door. Lift the door away from the doorway. Lean the door on the wall next to the doorway. Unscrew the hinge frames from the top and bottom of the door with the Phillips-head screwdriver. Repeat this procedure with the hinges on the doorway. Open up a piano hinge. Line up one of the two sides of the piano hinge with the top corner of the door on the side facing you. Screw the wood screws through the holes in the piano hinge and into the door with the electric screwdriver. Repeat this procedure at the bottom corner of the door. Place the door in front of the doorway with the right side of the door touching the wall. Place the free ends of the piano hinges onto the wall. Draw a dot through each of the holes in the free end of the piano hinges onto the wall with the pencil. Put the door aside. Hammer a hole into each of the pencil dots made on the wall with the point of the metal nail. Place a plastic tab into each of the holes in the wall. Tap the plastic tabs into the wall with the hammer. Place the door back into its usual position over the doorway with the free ends of the piano hinges over the corresponding holes on the wall. Screw the wood screws into the free ends of the piano hinges and into the plastic tabs with the electric screwdriver.